Explore the Baltic States by bicycle on this guided route through Lithuania, Latvia and Estonia. Cycle through national parks, coastal scenes and medieval towns; past feudal castles and picturesque fishing villages. Arrive in Vilnius and check into hotel, our base for two nights. Vilnius is known for its old town of beautiful architecture, declared a UNESCO World Heritage Site in 1994. It has a strong historical Jewish influence and Napoleon named it 'the Jerusalem of the North' as he was passing through in 1812. In the year 2009, Vilnius was the European Capital of Culture, together with the Austrian city of Linz. This morning we drive 28 kilometres from Vilnius to Trakai Historical National Park. Outside the capital we find a peaceful land of forests, lakes, rivers and farmsteads. Our first stop is at the Uzutrakis Manor House, built 1897-1902 by count Jozef Tyszkiewicz. When the Soviet Union occupied Lithuania in 1940, Uzutrakis manor was nationalized and after the war the manor became a sanatorium for soviet security officers. Here we prepare our bikes and get comfortable on a short cycle around the park before continuing 10km to Trakai town around the shores of the lake along a mixture of quiet back roads and dedicated cycle paths. Trakai was an important seat of power in the Grand Duchy of Lithuania during the 14th and 15th centuries, ruling an empire that stretched all the way down to the Black Sea. We will pedal around Trakai visiting the Church of the Visitation of the Blessed Virgin Mary, the Island Castle - a Lithuanian 'must see' and the peninsular Trakai Castle ruins. There are many cafés and restaurants to choose from for a lunch break. After visiting the principal sites and having lunch (not included), depending on time we will either drive straight back to Vilnius or cycle firstly back to Uzutrakis Manor House then take the bus back to Vilnius. The route today goes along asphalt roads with light traffic and some biking paths. This morning we see more of Lithuania's countryside with a 4 to 5 hour drive towards the Baltic Sea to Kintai village where we have lunch before getting our bikes ready. After lunch we cycle for about 10 km on the flat and beside the Curonian Lagoon, along a quiet paved road to Vente Cape. Vente Cape is a small peninsula on the eastern side of Curonian Lagoon. More than 50,000 visitors come each year in order to get acquainted with one of the most important spots for bird migration in the region. We make a visit to Ventes Ragas and 19th century lighthouse and the Ornithological Station where the migration patterns of many bird species are tracked and recorded. Huge nets are used to catch the birds they tag. We then cycle back the same 10 km route to Kintai village. From here we join a forest bike track and continue along this bumpy gravel track through the fishing villages of Priekule, Surmai to Dreverna where the group ride finishes and we rejoin our vehicle for the transfer to Klaipeda. Klaipeda is the third biggest city in Lithuania, an important port and Lithuania's chief gateway to the Baltic Sea. It has a long history from a tribal fishing village and later arrival of German Crusaders who seized this land and built their castle here in 1252, later known as Memel. Today we take a short ride by bus to the harbour and take the 5 minute ferry ride to the Curonian Spit National Park then drive for about 1 hour to Nida. We stop en route briefly at the Hill of Witches in Juodkrante to see a colony of grey herons and cormorants. We get on our bikes in Nida to explore the village. Nida is a charming fishing village with a number of well-preserved old wooden fisherman's houses and with only approximately 1650 inhabitants is the largest on the Curonian Spit. A peaceful and relaxing atmosphere pervades throughout the Curonian Spit. Here we can visit the amber gallery, Thomas Mann house, the highest dune for views over the surrounding landscape and giant sundial, Panirdzio and the old town. We continue by bike through the forested Curonian Spit national park (UNESCO World Heritage Site) on asphalt dedicated bike paths mostly on the flat. We will cycle alongside giant sand dunes, hundred year-old pine forests and hill pine trees, white sand beaches; learn about its unique culture and architecture and you may like to try some of the typical local smoked fish. We leave the bikes for a short walk along a wooden path to the Dead Dunes beyond Pervalka where a panoramic view of both the Baltic Sea and the Curonian Lagoon opens up. After relaxing in Juodkrante you have the choice to take the bus to our hotel or cycle the remaining 12 km from Juodkrante to Smiltyne then take the ferry back to Klaipeda harbour, ending with a final 2 to 4 km to the hotel. 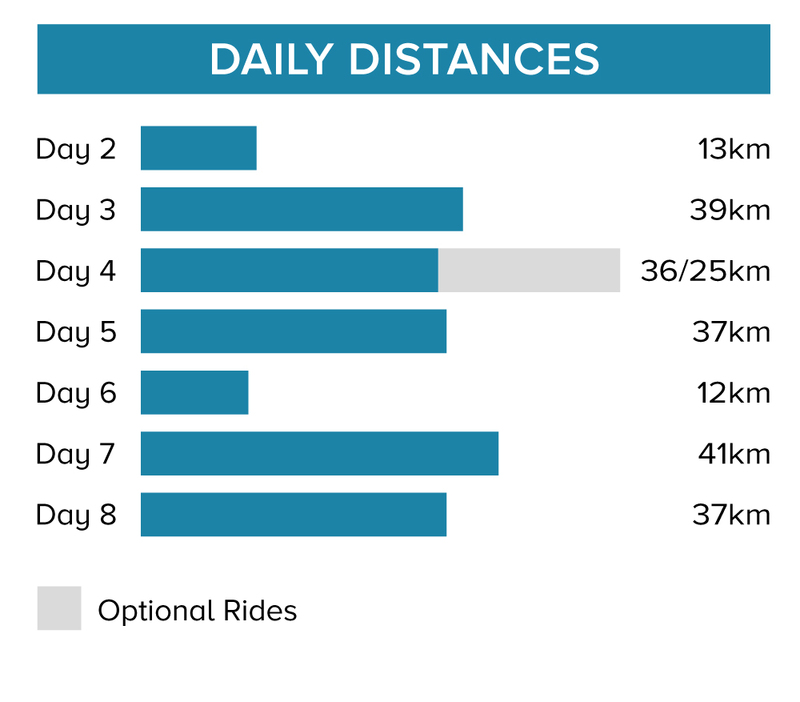 Our total cycling distance today is approximately 36 kilometres, with a further optional 22 km available. After a short transfer from our hotel in Klaipeda we cycle along the coastline on a dedicated and paved cycle route through the Giruliai Forest to the popular summer resort of Palanga. Along the way we visit the Seaside Regional Park including the Dutchmen's cap - a 24-metre-high cliff, the fishing village of Karkle, Plaze Lake and the former lifeguard station in Nemirseta. Before lunch we explore Palanga Botanical Park and the biggest Amber Museum in the Baltics, J. Basanavièius Pedestrian Street and a pier heading 470 hundred metres into the sea in Palanga. Palanga's population swells enormously in the summer months as it is the premier beach destination in Lithuania and boasts a beautiful sweeping beach. From Palanga after lunch we continue cycling a further 15 km on cycle paths and finish in Sventoji town before we drive to Riga. The bus journey to is approximately 4 to 5 hours long. Riga is the capital and largest city of Latvia and infact the largest city of the Baltic states. It boasts superb architecture spanning over six centuries and has an impressive collection of beautifully decorated Art Nouveau buildings. After breakfast we drive to Jurmala where todays cycling takes place. One of the largest resort towns in the Baltics with 32 km of white sandy beach fringed by pine forests, the area is known for the interesting architecture of its old wooden summer cottages and more recently built villas. Jurmala's reputation as a spa destination began in the late 18th and early 19th centuries. Wealthy landowners began the tradition of relaxing at the seaside, and Russian army officers came here to rest after the Napoleonic Wars, returning later with their families. The peak of the Jurmala area's development was the opening of the Riga - Tukums railway in 1877 (which still passes through Jurmala) that gave a great boost to the numbers of visitors, and thus a boost to the development of the town as a resort. Jurmala also gained a reputation as a health spa. The sea breeze, pine aroma, mineral springs and sandy beach encouraged many sanatoriums to develop within the city. We start on our bikes with an exploration of the town itself and its interesting buildings, before heading down towards the Bulluciems Peninsula and back. We then cycle along the beach for about 12 km, picking the hardest sand right on the shoreline of the Baltic Sea that is perfect for cycling. You can have drink, ice cream and swim stops along the way. We meet our bus at a beach café rendezvous point before we drive back to Riga and have free time to explore the city. Our total cycling distance today is approximately 28 kilometres , just under half of which is on the beach. This morning we drive for about 6 hours to Lahemaa National Park, Estonia's first and largest national park. The park is an interesting mix of coastal bluffs, dense forest, 7000 year old bogs, 18th century manor houses, fishing villages and numerous lakes and rivers. The rocky coastline is strewn with erratic boulders, some very large, that were carried here by glaciers thousands of years ago. Most of the cycle routes are on well paved roads that have little traffic. Once we arrive we check into our hotel then head out on our bikes on a circular route to explore the park. This morning we continue to explore the vast natural beauty of Lahemaa National Park by bike. Established in 1971, it was the first national park in Estonia and two-thirds of the land is covered by forest. There are four large peninsulas in Lahemaa and one of them constitutes the northernmost point of continental Estonia. The park is home to moose, boars, brown bears, lynxes, foxes, beavers, the Ural Owl and Black Woodpecker. We plan to cycle another circular route before rejoining our bus. When we have finished in the park after a short lunch in a local cafe we drive for about 1.5 hours to Tallinn. Todays cycle route is planned first thing in the morning so we can check into our hotel in Tallinn in time to enjoy a free afternoon in this wonderful city. The tour ends in Tallinn this morning after breakfast. General: Pack essentially for hot or mild weather depending on the time of the year plus some warmer clothes for colder nights. Ladies should take a headscarf for entering churches. You may want to pack a swimsuit and towel, depending on the time of year, as there will be some opportunities to swim. We recommend you bring a daypack and one main piece of luggage (total allowance: 44lb/20kg) which will be transported between hotels while you cycle. Check the bike details section to see if a pannier or handlebar bag is provided on the bike. Remember that you'll have to carry your own luggage so don't overload yourself. On all Explore cycle holidays we strongly recommend you bring along and wear your cycle helmet. In case of an accident resulting in personal injury, certain insurance policies are invalidated in cases where a helmet was not being worn. Cycle glasses to protect against dust, pollen and the sun, padded cycle gloves and a water bottle or water delivery system (e.g. camelback or platypus) are also useful. You may choose to bring your own gel seat cover for added comfort. Bring an eye mask for sleeping during white nights. Other items to consider bringing are a sunhat and sun cream, torch, earplugs and insect repellent. Please carry some or all of your cycling equipment e.g. helmet as part of your hand luggage. Although entirely voluntary, tipping is a recognised part of life in this region of the world. Some local staff will look to members of the group for personal recognition of particular services provided. In order to make things easier for you, the Tour Leaders may organise a group's tips kitty and if this is the case, they will account for it throughout the tour. Lithuania: Visas are not required by UK, Australian, New Zealand, US and Canadian citizens. Latvia: Visas are not required by UK, Australian, New Zealand, US and Canadian citizens. On this trip we cycle 241 km over seven days (an average of 34 km per day) with a further optional 22 km available. We generally follow flat cycle paths and quiet asphalt roads. A support vehicle will accompany our rides where possible and transports our luggage throughout the trip. We have graded this route as easy. 7 gear Kalkhoff Jubilee hybrid bikes with front suspension. Electric bikes (e-bikes) are available for an additional cost for the duration of the holiday. You will be required to pay a refundable deposit upon collection of the e-bike in country. Please contact us for more details or to request your e-bike. Your included bike is a 7 gear Kalkhoff Jubilee hybrid bike with front suspension and will be the correct frame size for your height. A rear pannier is included and there is the facility to fit your own pedals (9/16) or saddle (male frame stem size 27.2 mm; female frame stem size 30.4mm) if you wish to bring them. A support vehicle accompanies the rides throughout the tour. We provide spare parts and take care of the day to day maintenance. All you need to bring is your own helmet.